Well, he's gone and declared a national emergency to scam the funds for his wall. 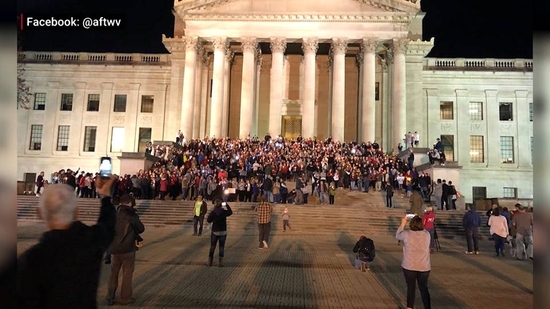 In West Virginia, teachers are launching a statewide strike today over an education reform bill that Republicans are trying to pass in the state Legislature. The bill would legalize charter schools, which are currently not allowed in the state. Teachers’ unions say they were not consulted in the drafting of the legislation and that it is a retaliation for last year’s historic strike, which was credited with launching a wave of teacher walkouts in other red states. 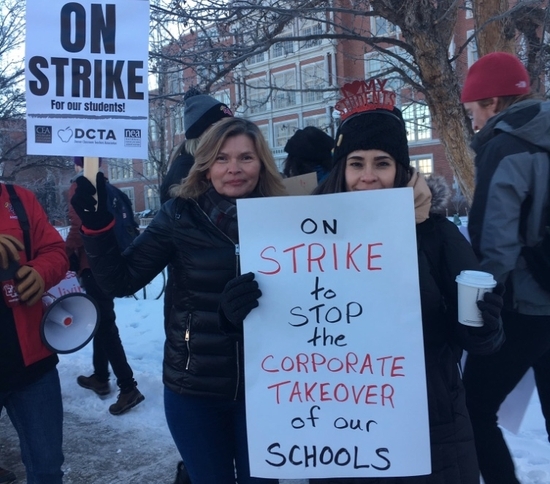 The action comes nearly one year after the 9-day strike led to a 5 percent raise for all state workers. Meanwhile, teachers in Oakland, California, have announced they are planning to go on strike starting Thursday to demand fair wages, smaller class sizes and more resources for their students. A coalition of 16 states have filed a federal lawsuit challenging President Trump’s national emergency declaration, claiming it is unconstitutional. California Attorney General Xavier Becerra filed the suit on behalf of the group Monday. He says Trump’s move violates Congress’s power to control the budget and is a misuse of public money. Also on Monday, President’s Day, protesters took to the streets around the country to denounce Trump’s emergency declaration. This is Diallo Brooks of People for the American Way speaking at a rally in Washington, D.C. In New York City, demonstrators turned out Friday evening in front of the Trump International Hotel to protest the emergency declaration. Multiple arrests were reported at the peaceful demonstration, after police blocked the sidewalks and protesters instead moved into the street. This is Jody Kuh of Rise and Resist, speaking to Democracy Now! Social justice was not a part of my life, activism wasn’t a part of my life, until I got to college. I had always cared about politics, but I cared about electoral politics. I saw it as different from activism — rather than how I view activism and electoral politics now, as part of the same apparatus for achieving the liberation of black, brown, and working-class people. My freshman year of college was when the Black Lives Matter movement began. It was the first time that social justice became proximal to me. I knew that if I wasn’t taking part in the Black Lives Matter movement that [it could be] me that was in the grave with my parents crying over it on the 5 o’clock news. I knew I had to be a part of the struggle. 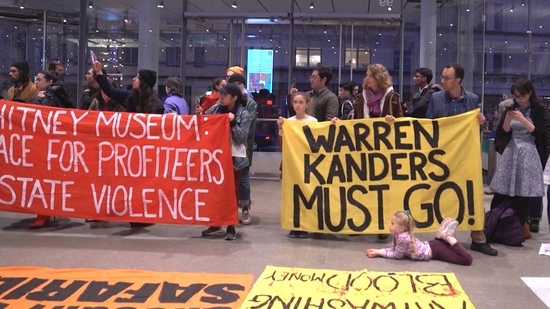 And in New York City, activists from over 30 groups took over the prestigious Whitney Museum Friday to call for the removal of Vice Chair Warren Kanders, CEO of tear gas manufacturer Safariland, from the museum’s board. he protest launched a 9-week series of actions organized by Decolonize This Place. Democracy Now! spoke to one of the activists at Friday’s action.